Spring is upon us and visions of rooftop parties and outdoor get togethers in the park are on everyone’s mind, which means we can almost smell the grill alight with plumes of smoke carrying the aromas of sweet charred meat. The time has come for red wine to shine with its glistening red hues, bottles dripping with condensation pleading you to cork and drink…wait red wine? When it’s cold outside we tend to gravitate toward big soulful reds that have depth and concentrated structure. These wines often pair well with the food of the fall and winter months. And even if we are drinking white wine, we tend to go as big as we can with Burgundian Chardonnays or Gewurztraminers. But when the snow melts we seek the more lean, streamlined, high-acid whites like Sauvignon Blanc or Gruner Veltliner. These wines are a perfect pairing to along with the warmer month’s lighter picnic fare. But what about that grill I was talking about? Maybe that wafting char from a juicy burger doesn’t scream high mineral white to you. What if you want a red but couldn’t imagine drinking it warm. Our solution: throw it on ice! 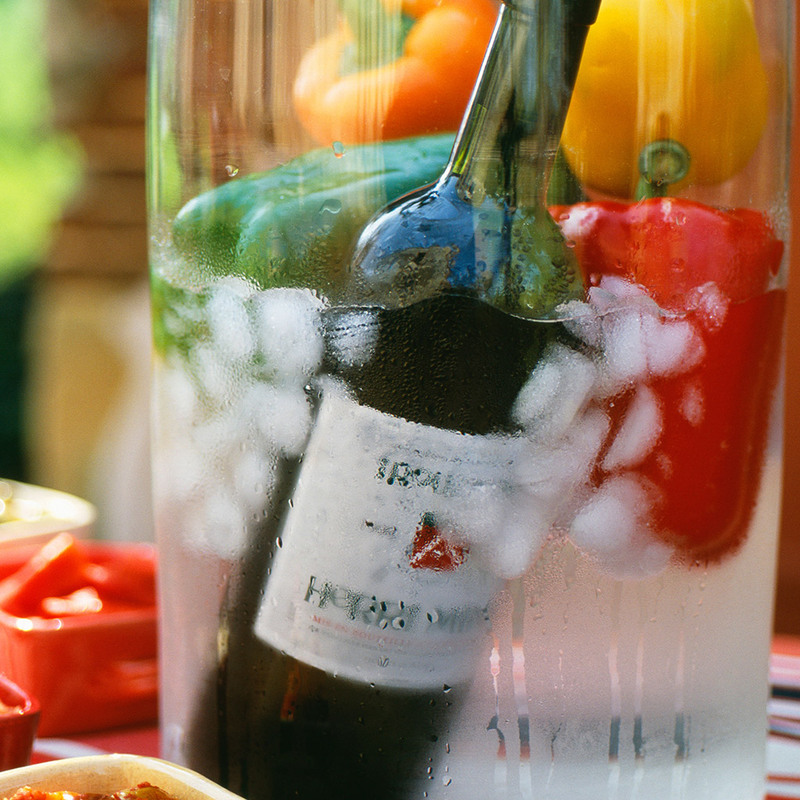 The trick to enjoying chilled red wine is finding wines with a good amount of acidity. This means wines that are younger and more vibrant. The softer, younger reds are what you will be looking for anyway due to the warm weather and it just so happens that they really do benefit from 30 minutes or so in the fridge or 15 to 20 minutes plunged into ice. The reason you want to go for a lighter red is because when a wine is chilled down past the 50 degree mark, whether white or red, some of the phenolics just go to sleep. The aromas the wine wants to give off are in shock and they need a little warming to shine. So if you were to chill down a heavy, full-bodied red and take a sip before you experienced the aromatics of the wine all you would get hit with is tannin and alcohol. At this temp, the alcohol is actually masked a little bit by the tannins and you may not realize how boozy that heavy wine is, causing you to drink at a faster pace and get all crunk too soon. Lighter reds have a higher acidity thus displacing the intensity of the more dense organic material in the wine and giving off aromas of bright red fruits instead of dark, brooding tobacco or leather strap. When you chill these wines they are still alive with personality due to the acidity and lower alcohol. Even though some of the wine is a little sleepy, it’s still giving you all the strawberries and cherries you love and as it warms in your glass, stemless or otherwise, it comes to the room temp at which it would normally be served. It’s perfect. A good wine shop should embrace the idea of chilling red wine and some will actually have them in the cooler or will be able to guide you to the right bottle or bottles. When in doubt just ask for a lighter red. The Gamay grape from the Beaujolais region of France is one my all time go-tos with all of those bright red fruits on the nose and violet and lilac as it warms in the glass. They are also often well priced at $11 and up. Pinot Noir is also a no brainer, but it can be a bit more expensive. My faves come from the Sancerre region of France but Oregon Pinots can really sing when chilled a little bit. Lesser known but popping up more and more are wines made from the Corvina grape in the Veneto region in northern Italy. Try to find one with no oak on it and don’t fear the dark crimson color — it’s filled with sour cherry goodness with slight bitter almond and chocolate notes. And last, but not least, a good chilled Zweigelt from Austria pairs heavenly with that homemade BBQ sauce, of which you’re so proud, being slathered onto them ribs! So go out and grab a few bottles and I’ll meet you on the rooftop for some good times and chilled red wines!